You can take this Taco salad dip to any party really. 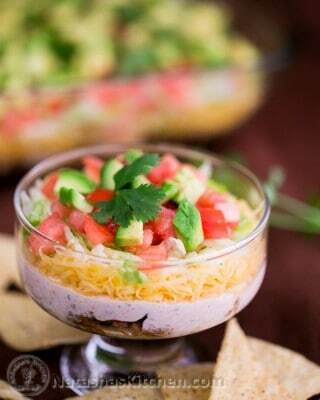 It's just an all-around-amazing dip; sort of like the 7-layer dip, but it holds it's own. In a large skillet, brown ground beef (No need to add oil). Drain with a paper-towel if there is excess liquid. My lean 7% beef didn't have any extra juices to drain. Combine 1 packet of taco seasoning mix with 1/4 cup water. Once the beef is fully cooked, stir the taco seasoning mix into the beef and remove from heat to cool down. In the bowl of a food processor, blend 1 cup cottage cheese, 1 package cream cheese and 1 cup salsa until well combined and smooth. Spread beef into the bottom of a 9x13-inch glass baking pan, or into individual glass ramekins. Top the meat with the blended cream cheese mixture. Sprinkle evenly with finely grated cheese. Top with sliced lettuce, diced tomatoes, avocado and cilantro (if using). If you aren't serving right away, you might squeeze some lime juice over your avocado to keep it from browning, then cover with plastic wrap and refrigerate until ready to serve. Serve with Taco chips; naturally.